As drug-resistant infections become a more serious threat, nanotechnology may present an answer. Quantum dots, currently used in place of organic dyes in various experiments using photoelectronics to trace the ways that drugs and other molecules move through the body, may have a new supportive role in healthcare. Scientists have engineered quantum dot nanoparticles that produce chemicals that can make bacteria more vulnerable to antibiotics. This will hopefully be a step forward in the fight against drug-resistant pathogens, like superbugs, and the infections they cause. 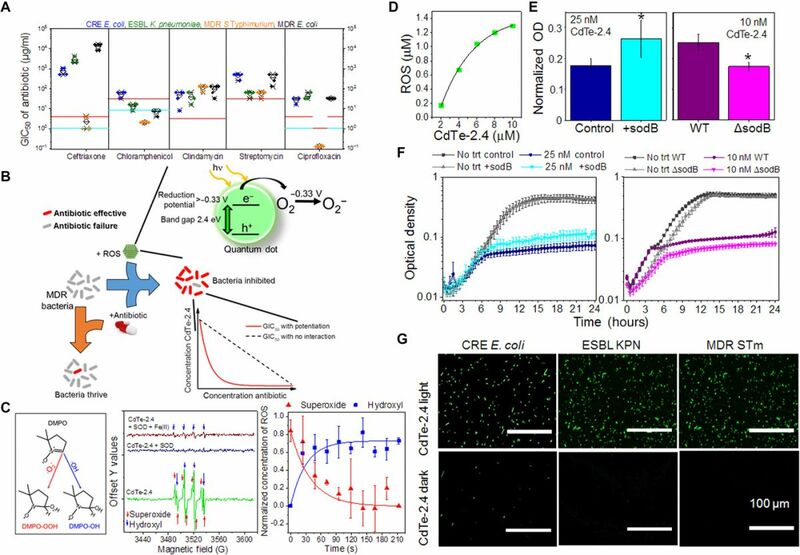 In this study, antibiotics empowered by the experimental quantum dots were 1,000 times more effective at fighting off bacteria than antibiotics alone. The quantum dots used were about the width of a strand of DNA, 3 nanometers in diameter. The dots were made of cadmium telluride, a stable crystalline compound often used in photovoltaics. The electrons of the quantum dots react to green light at a particular frequency, causing them to bond with oxygen molecules in the body and form superoxide. Bacteria that absorbs the substance are unable to fend off antibiotics, as their internal chemistry falls out of balance. The team mixed different quantities of quantum dots into varying concentrations of each of five antibiotics to create the range of samples for testing. They then added these test samples to five strains of drug-resistant bacteria, including methicillin-resistant Staphylococcus aureus, also known as MRSA, and Salmonella. In the 480 tests with different quantum dots/antibiotics/bacteria combinations, more than 75 percent of the samples with quantum dots were able to curb bacterial growth or kill the bacteria entirely with lower doses of antibiotics. According to the World Health Organization (WHO), antibiotic resistance is among the most serious threats to food security, health, and development in the world. It can affect anyone in any country, and infections like gonorrhea, pneumonia, and tuberculosis that were once simple to treat are now becoming increasingly difficult to manage due to antibiotic resistance. Aside from obvious health and even mortality risks, antibiotic resistance also causes higher medical costs and longer hospital stays. And, although some level of antibiotic resistance occurs naturally as bacteria adapt to survive, misuse of antibiotics in both animals and humans is drastically accelerating this process. In the US alone, at least 2 million people are affected by antibiotic resistance every year. And, if nothing is done to combat this problem, by 2050 antibiotic resistance will kill more than 10 million people. Researchers are working on a variety of techniques to overcome this challenge. Some are using CRISPR to attack the bacteria directly, while others are looking for answers by studying the ways that ants battle detrimental fungi. Meanwhile, scientists are searching for the genetic origins of antibiotic resistance and some are even battling resistance by studying the ways bacteria behave in space. One limitation of this study’s use of quantum dots is the light that activates the process; it has to come from somewhere, and it can only radiate through a few millimeters of flesh. For now, these quantum dots would really only be useful for surface issues. However, the team is also working to develop nanoparticles that absorb infrared light instead, as infrared light can pass through the body and could be used to treat bone and deep tissue infections.